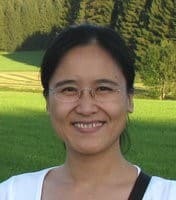 Prof. Zhang Chunjie (University of California, Davis) received a fellowship for experienced researchers that will allow her to conduct 18 months of research at Göttingen University over the next three years. She will be based at the Platform for Global and Transregional Studies and the Department of East Asian Studies (collaborating with Dominic Sachsenmaier). seeks to compare cosmopolitan thinking in German and Chinese discourses in the first half of the twentieth century.The vibrant intellectual exchanges between Europe and China and the cosmopolitan impulses among German and Chinese thinkers from the 1890s to the 1940s provide us rich resources for exploring the discrepancies and similarities of cosmopolitan visions in cultural, political, and global contexts. Ms Zhang is associate professor of German at the University of California at Davis. She is the author of “Transculturality and German Discourse in the Age of European Colonialism” (Northwestern UP 2017). Her research interests include the global eighteenth century, postcolonial theory, comparative modernisms, and Asian-German studies. She received her Ph.D. from Duke University after earning an MA degree at Universität Tübingen und a BA from Peking University, China.